ONLY esoteric trainspotters pay much attention to freight locomotives. By comparison with passenger trains, they generate few furious letters to local newspapers. 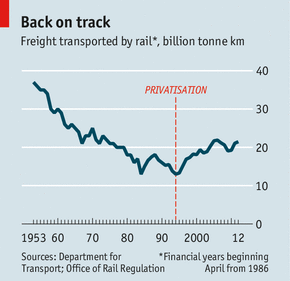 Freight is rarely cited in rows over the effects of rail privatisation in the 1990s. Yet rail freight is growing (see chart) and is an excellent argument for railway reform. Between 1965 and 1985 rail freight slumped from 25 billion net tonne kilometres a year (a measure of the weight and distance of goods carried) to 15 billion. All of the freight businesses were then owned by British Rail, which invested little in them. Road hauliers were eating into their business, helped by a liberalised market and new licensing rules for lorries. Since privatisation in 1994, though, £1.5 billion ($2.4 billion) has been invested in rail wagons, locomotives and other improvements. The amount of freight moved increased by 65% between 1995 and 2006. Volumes dipped following the financial crisis, but have recovered. The Office of Rail Regulation (ORR) estimates that the market will grow at least 10% more by 2019. Freight has become far more efficient. Between 1998 and 2008 the number of staff per freight train million kilometres travelled fell from 100 to 65. On passenger railways, by contrast, the number of staff per train kilometres increased slightly. “It is the most transformed sector in the rail industry since privatisation,” says Richard Price, the chief executive of ORR. The business has become far more competitive. Seven freight rail companies directly compete with each other on the tracks, as well as with road haulage companies. Unlike passenger networks, they receive no direct subsidy and are not franchised. Whereas their passenger equivalents tend to monopolise regions, freight networks can charge up and down the country. 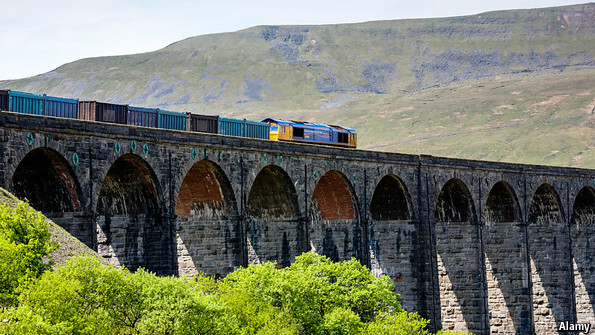 Rail freight is not encumbered by the short-term contracts common in the passenger railway system, which make train companies petrified of strikes and strengthen the hand of drivers’ unions. Raw materials have long been moved by rail, but so, these days, are consumer goods. Between 2001 and 2011 the amount of containerised goods transported by rail increased by 80%. At Felixstowe, Britain’s largest container port, the proportion of containers leaving by rail has jumped from 14% in 2002 to 27% now. Two weeks ago a third terminal was opened there which should double the number of containers sent out by rail again. Many of those goods come from China. But there is also an upsurge in the domestic market, says Maggie Simpson of the Rail Freight Group. Supermarkets are starting to use the railways, which are often quicker than roads. Tesco has five dedicated freight trains that run each day. Improved temperature-controlled services have boosted the amount of freight through the Channel Tunnel from southern Europe. Bumps lie ahead. Coal still accounts for a third of the freight rail market. As use of the fuel is scaled back to hit EU carbon targets, this will decline. Freight fanatics are also anxious about the possible introduction of 25-metre-long “megatrucks” to Europe. And the shift from transporting manufactured items to consumer goods has squeezed margins, says Tim Robinson of Network Rail. Whereas bulk goods such as aggregates, steel and other materials could only really be shipped by rail, the rise of consumer-goods transport means that freight must compete more directly with the roads. But the shift to renewable energy could prove a boon. Biomass—pulped wood burnt to generate electricity—must be shipped carefully to prevent it from decaying and releasing methane. This is easier by rail. Planned upgrades worth £9.4 billion to Britain’s railway lines due to start in 2014 include an “electric spine” between Yorkshire and the West Midlands to ports on the south coast. This will boost capacity and could lead to the electrification of freight lines. The mooted high-speed railway, known as HS2, ought to free up capacity on the southern part of the West Coast mainline, which could be used for freight instead. And with less fuel needed to haul a tonne of goods by rail than by trucks lumbering along congested roads, the rise of freight looks unlikely to stop soon.